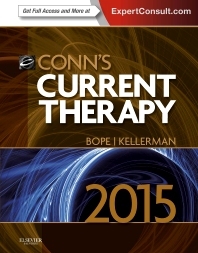 Ideal for busy medical practitioners who need quick, reliable answers, Conn’s Current Therapy 2015 is an easy-to-use, in-depth guide that focuses solely on the most up-to-date treatment protocols for common complaints, acute disease and chronic illness. Drs. Edward T. Bope and Rick D. Kellerman present the expertise and knowledge of hundreds of skilled international leaders on evidence-based clinical management options. With key diagnostic points and treatment recommendation tables, you'll have quick access to the information you need to make accurate clinical decisions. Find answers quickly so you can dedicate more time to treatment with practical and accurate advice by renowned international experts on diagnosis and management, delivered via a templated, at-a-glance approach. Take it with you anywhere! With Expert Consult, you'll have access to the full text, image library, and more online, and as an eBook - at no additional cost!